Rob Jackson refuses to let age slow him down. 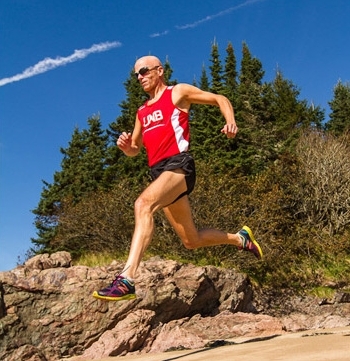 He may have been a rookie on the Varsity Reds cross-country team this year, but the 57-year-old lawyer and full-time UNB student may also be the oldest varsity sports athlete in CIS sport history. Knowing that second-chances don't come easily at his age, Jackson has worked hard to make 2012 memorable. After setting provincial age class records in the 1,500 metre, the 3,000 metre, the 10K, the 10-mile and the half marathon, Jackson decided to sign up at UNB full-time, which allowed him to be on the university's cross-country team. His coach, Tim Randall, said in a CBC interview that the only part of coaching Jackson that makes his job challenging is trying to get him not to run too much.